Warren’s insistence at defending her claims to Cherokee heritage at all costs is dangerous, self-serving, and harmful. In response to Warren’s highly orchestrated media roll out, the Cherokee Nation released a statement that her use of the DNA test was “inappropriate and wrong” and that her continued claim to Cherokee heritage is “undermining tribal interests.”...It’s important that non-Native people walk away from this mess with the correct conclusion that Native people are the authority on who is and who isn’t Native...The science behind Warren’s specific DNA test used examples of Indigenous people from Mexico, Peru, and Colombia, and included no sample from anyone who is Cherokee or even another Native American tribe from the Southeast (Cherokee traditional homelands). The test only shows that Warren may have an ancestor who was from North, Central, or South America...DNA tests have no way to determine tribal heritage and it’s a gross misinterpretation of both the science and tribal sovereignty to claim that they do...Warren could have put this issue to rest years ago by simply apologizing for listing herself as a minority during her academic career and for touting her supposed Native American heritage over the years, and by admitting she made a mistake, which she still refuses to do. When people ask what should "count" as being "Native American enough" (or black enough, or Latino enough, etc.) in the realms of professional hiring and university admissions, I'm not sure there are easy or clean-cut answers. Crafting such policies can be a fraught adventure, in which complicated interests must be weighed. I suspect many Americans would draw a line to exclude applicants who are more than a few generations removed from an ancestor of a certain race or ethnicity. For instance, should an overwhelmingly white person be permitted to gain academic or career advantages by claiming to be "African American," based on a fractional and distant piece of his family tree, or a DNA test? Or would that be cynical exploitation? At some point, such machinations look like transparent and self-interested abuses of race-based affirmative action (to which I'm generally opposed anyway). Warren falls into this category. Under this scenario, unfortunately for her, the "what counts?" and "who decides?" questions actually have a straightforward reply: The Native American tribes decide what 'counts.' 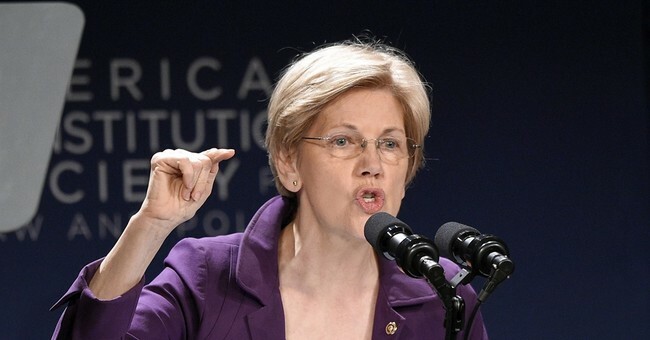 On this score, writing at Current Affairs, a liberal who describes himself as an admirer of Warren's politics takes apart her "indefensible claim:"
These are things Warren should not have done, because she is not a Native American. It would have been easy to apologize. To say that, like many white Americans, she has a family story about being part Native American, and she got carried away with it. Instead, however, Warren has reaffirmed her claim...Warren has reinforced incorrect conceptions of what it means to be Native American, saying at one point that she “knew her grandfather was ‘part’ Cherokee because ‘he had high cheekbones like all of the Indians. '” ...Now, Warren has released the results of a DNA test that she claims proves her claim to be part Native American, thereby justifying actions such as listing herself as a racial minority, allowing Harvard Law to claim her as its first woman of color, and calling herself Cherokee...If the test proved anything, it proved the opposite of what Warren said it proved, showing that her claimed ancestry is almost negligible at best. The test showed Warren to have between 1/64 and 1/1024 Native ancestry, with one ancestor six to ten generations ago, meaning one person probably in the 18th century and possibly as far back as 1700. By this standard, a very, very large number of white Americans could list themselves as being “Cherokee” in the tribal cookbook. More importantly, though, the use of the DNA test was itself both questionable and insulting to Native Americans...I don’t understand why Warren would go to the trouble of taking the test and having a sleek professional video made if she hadn’t first consulted with the Cherokee Nation itself to see what she ought to do. That, to me, suggests a disregard for the interests and opinions of Native people.